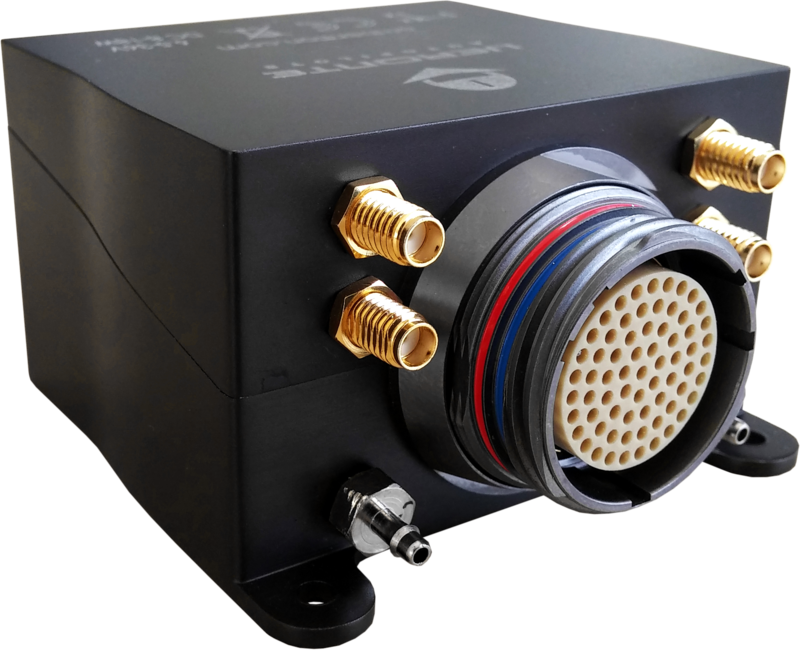 Veronte is provided using an anodized aluminium enclosure with enhanced EMI shielding and IP protection. 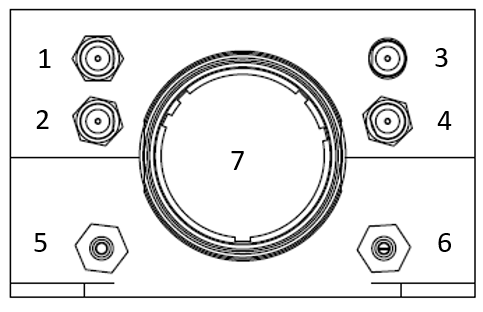 A high reliability connector is also provided in this version. 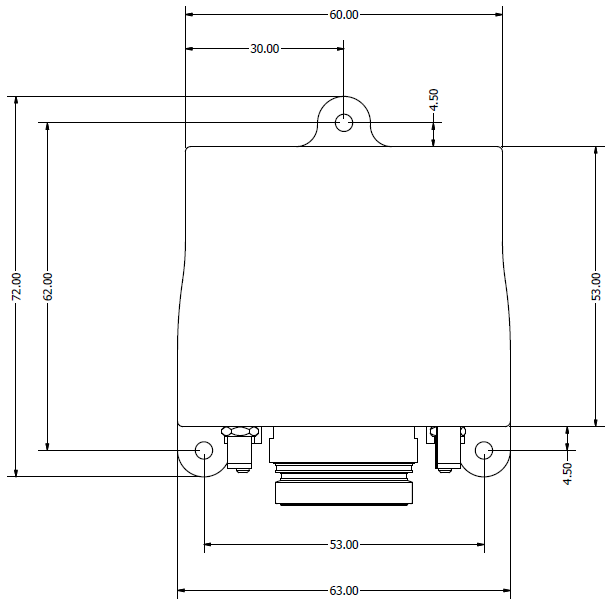 The total approximate weight is 190 g.
Veronte can be provided in OEM version too. M3 screws are recommended for mounting. Although Veronte ultimately rejects noise and high-frequency modes of vibration with electronic filters, an adequate vibration isolation design can improve the performances and extend the lifetime of Veronte. Veronte can be mounted in different ways in order to reject the airframe vibration. The simplest could be achieved by just using double-sided tape on the bottom side of Veronte. Other ways may use some external structure which could be rigidly attached to the airframe and softly attached to Veronte (e.g. foam, silent blocks, αgel, etc…). The user should take into account that wiring should be positioned in a way which allows avoiding vibration transmission from airframe to autopilot. In cases where Veronte isolation is not viable, it is possible to use soft engine mounts. It is also recommended when there are other sensible payloads like video cameras or for high vibration engines. The location of Veronte has no restrictions. You only need to configure its relative position with respect to the centre of mass of the aircraft and the GNSS antenna. The configuration of the location of Veronte can be easily configured using VerontePipe Software. The orientation of Veronte has no restrictions either. You only need to configure Veronte axes with respect to the aircraft body axes by means of a rotation matrix or a set of correspondences between axes. The configuration of the orientation of Veronte can be easily configured using Veronte Pipe Software. Veronte axes are printed on the box and aircraft coordinates are defined by the standard aeronautical conventions. 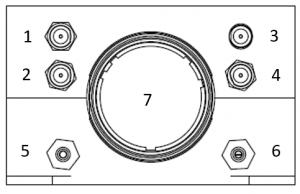 For both pressure ports, mating with clamped 2mm internal diameter flexible tubing is recommended. 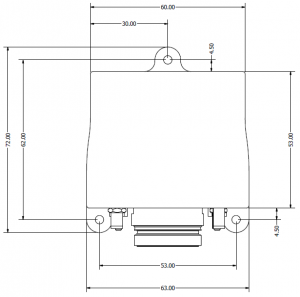 (SSMA Jack Female) SSMA male Plug, low-loss cable is recommended. 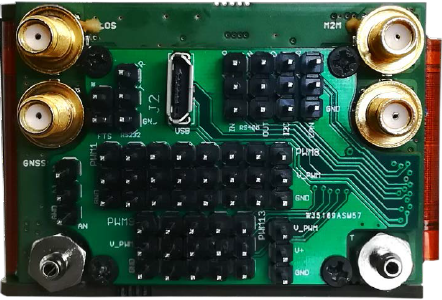 Active Antenna GNSS: Gain min 15dB (to compensate signal loss in RF Cable) max 50dB, maximum noise figure 1.5dB, power supply 3.3V max current 20 mA. Mating harness is available on demand. The system uses different kinds of antennas to operate that must be installed on the airframe. Here you can find some advice for obtaining the best performance and for avoiding antenna interferences. Maximize separation between antennas as much as possible. Keep them far away from alternators or other interference generators. Always isolate antenna ground panel from the aircraft structure. Make sure the antenna is securely mounted. Always use high-quality RF wires minimising the wire length. Always follow the antenna manufacturer manual. Antenna top side must point the sky. Install it on a top surface with direct sky view. Never place metallic / carbon parts or wires above the antenna. It is recommended to install it on a small ground plane. Be sure connecting SMA wires avoiding to turn the autopilot SMA Plug female connector because the antennas internal cables could be turned and damaged. Veronte has two pressure input lines, one for static pressure to determine the absolute pressure and one for pitot in order to determine the dynamic pressure. Absolute pressure connection on the aircraft is mandatory while pitot port can be obviated in some aircraft, pitot port absence must be configured on Veronte Pipe software. Pressure intakes must be located in order to prevent clogging. Never install pressure intakes on the propeller flow. Design pressure tubing path in order to avoid tube constriction. It is not recommended to use inside fuselage pressure if it is not properly vented. 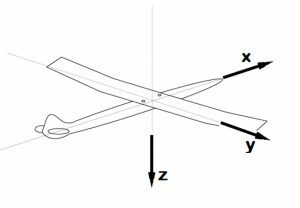 Pitot tube must be installed facing the airflow in the direction of the “x” axis of the aircraft. It is recommended to install it near the aircraft axis in order to avoid false measures during manoeuvres. For low-speed aircraft, it is recommended at least 6,3mm tubes for preventing rain obstruction. Pitot pressure ranges are configurable on Veronte Hardware when placing an order, please review that selected sensor fits with aircraft speed. To perform a Pitot test is sufficient a little blow into the tube. Blowing with energy could damage the dynamic pressure sensor of the autopilot.